Pretzels are a pantry staple in our house. They are great for healthy snacking for both kids and adults. I personally love to dip Pretzel Thins in hummus or a cheese spread–yum! 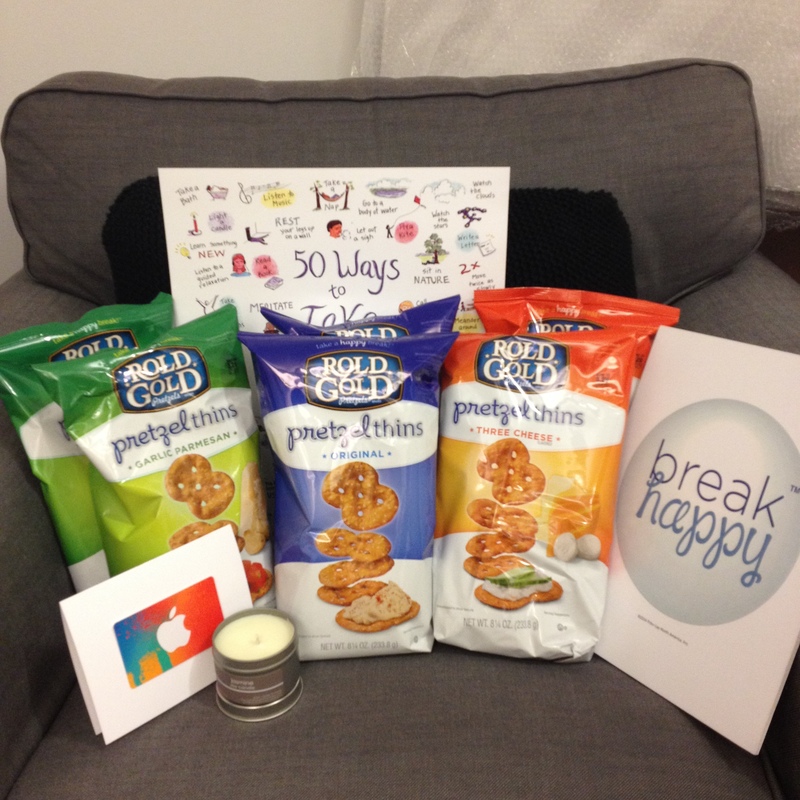 To help celebrate National Pretzel Day, Rold Gold sent us an awesome assortment of their Pretzel Thins and some other fun prizes to encourage us to take a break and relax. What a fun gift pack to receive! Even better, though, are the recipes that Frito-Lay chef Jody Denton was able to share with The Mommy Avenger! Check out his tips for making snacks using Pretzel Thins in the video below! These are fun recipes to try and after listening to him, I am totally inspired to get my kids together to make some fun snacks!. I love that there are so many ways to serve this snack time favorite! I will be testing out these recipes to serve at gatherings in the near future, the hazelnut spread with raspberries will be one my kids go crazy for! Here are some fun recipes for you to try, too! Spread about a teaspoon of chocolate hazelnut spread on the bottom (the side that isn’t shiny) of each Pretzel Thin. Top a chocolate hazelnut spread coated Pretzel Thin with 2 or 3 raspberries, place another Pretzel Thin on top with the chocolate hazelnut spread side down and press firmly until the raspberries are slightly smashed down. Serve immediately and enjoy! Place the cream cheese, sun dried tomatoes, pesto and parmesan in a food processor and run until smooth. Serve and enjoy! Using a very small scoop, make a small scoop of ice cream, form it somewhat in a rectangular shape and then flatten it slightly with the side of a knife blade. When finished it should be roughly the size and shape of a Pretzel Thin. Place ice cream on top of a Pretzel Thin and gently press another Pretzel Thin over it to make a sandwich. Place each one in the freezer when done before making another. Keep going until you run out of pretzels or ice cream! After the ice cream sandwiches have been in the freezer for an hour, take them out and either dip them or drizzle with Smuckers Magic Shell and return to the freezer. Serve them straight from the freezer and enjoy!u run out of pretzels or ice cream! After the ice cream sandwiches have been in the freezer for an hour, take them out and either dip them or drizzle with Smuckers Magic Shell and return to the freezer. Serve them straight from the freezer and enjoy! Spread about 2 teaspoons of goat cheese on top of a Pretzel Thin. Top with about ½ teaspoon of tapenade. Serve immediately and enjoy! Thanks for stopping by my blog and leaving a comment! Also, I did not know there was a National Pretzel Day, and that ice cream sandwich recipe honestly had me drooling! Thanks for sharing! YUM!